Mount Dempo is the highest volcano in South Sumatra that lies between ridge mountains and Gumai. The highest peak is called Mount Merapi with an altitude of 3173 meters above sea level or 2900 meters above the highlands of Pasumah. The other peak is Mount Serpeh (2863 m), Mount Gentengtoi and Mt Kumbang (2862 m) which is the rest of the volcanic activity of the past. 1818-1900; No date of the date. Causes some of the forest to be damaged, the peak becomes barren and dry, wooden trees partially burned and collapsed. 1900-1958; On June 4, 1900 came the sound of a cannon fire from the direction of G.dempo, then soaring a high smoke pole. This activity took place again on October 26 and 27, 1900. Then in 1905 Every 20 minutes there is boiling water crater lake, burst of cone-shaped water reaches a height of 12 m lk. 1974; Sulfuric Rain from the Crater of Mount Dempo, Daily Gala 1974, p.2 (Bandung). September 25, 2006 there was a phreatic eruption. On 26 September 2006 activity status was raised to level 2 (alert). Monitoring results from the PGA Post to the summit of Mount Dempo conducted since the occurrence of the phreatic eruption until until January 25, 2007 did not show the activity of smoke blast / eruption that comes from Marapi-Dempo Crater. Activity of Mount Dempo at that time tends to decrease. Based on the seismic, visual, and data analysis data; then the date of January 27, 2007 at 18:00 pm, the status of Mount Dempo activity was lowered from “Waspada” (Level II) to “Active Normal” (Level I) 50-100 m thick white smoke. The number of volcanic earthquakes recorded reached 20 events per day. December 27, 2008 recorded 1 times the occurrence of Volcanic Earthquake In (VA) and 2 times the incident Tectonic Earthquake Deep (TJ) December 28, 2008 recorded 1 times the occurrence of Volcanic Earthquake In (VA) and 1 times the Earthquake Hemorrhagic (HB) December 29, 2008 recorded 5 times the occurrence of Earthquake Blow (HB), 1 times the occurrence of the Local Tectonic Earthquake (TL), 2 times the incident Tectonic Earthquake (TJ). December 30, 2008 recorded 1 occurrence of shallow volcanic earthquake (VB), 1 occurrence of Earthquake Blowing (HB), 1 occurrence Low Frequency Earthquake (LF), 1 time of Tectonic Remote Earthquake (TJ). December 31, 2008 recorded 1 times the occurrence of Volcanic Earthquake In (VA) and 1 times the occurrence of Earthquake Blow (HB), 2 times the incident Tectonic Earthquake (TJ). Dempo Mountain morphology is generally formed by lava covered by pyroclastic deposits. 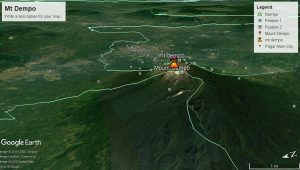 There are several peaks that form the alignment from west to east, namely Mount Serpeh, Mount Gentingloa, Mount Kumbang, Bukit Terban, Mount Merapi and Mount Dempo itself which is evidence of changes in the center of the eruption. The oldest rocks from Mount Dempo are tertiary sedimentary rocks that are assumed to be basement rocks, consisting of Tuff and Sand rocks. The tertiary volcanic deposits of Mount Dempo are lava, pyroclastic flow, and pyroclastic deposits deposited in the water environment. This is evidenced by the presence of lignite and wood deposits. Part of this rock is intruded by phorphric diorite-phorphyric dacite rocks in the northwest. This intrusion appears conical with a diameter of 300 – 500 m.
Mandiangin peak appears west of Mount Dempo and is an older peak than Mount Dempo. This is evidenced by the presence of Mt Dempo products that cover the body. The fluviovolcanic sediment is found in the east which consists of the flow of the lastik product, lava, tuff and river sediment. Mount Dempo itself produces volcanic products such as lava, lava andesite – basaltic, piroklastk fall and pyroclastic flow. The youngest sediment is alluvium. The evolving geological structures are shear faults (dextral and sinistral), normal faults, fractures in the peak areas, and topographic straightness. Activity mt Dempo is currently at the youngest crater of Merapi crater. All recorded eruption activity occurs in this crater.